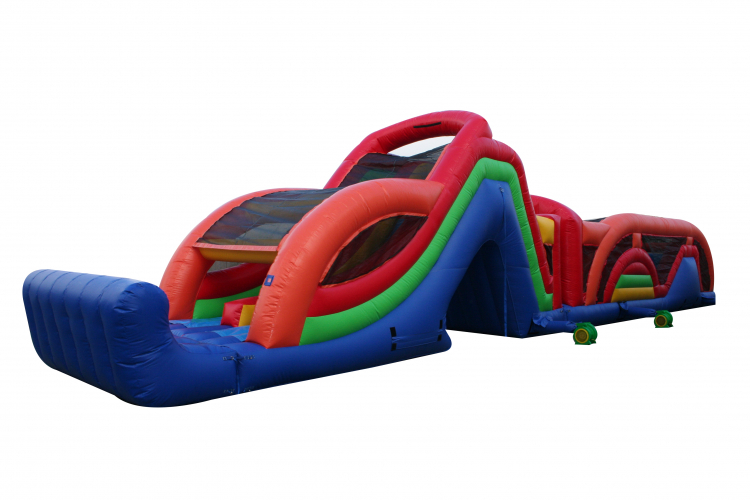 The new slick design of the 68 foot long adrenaline rush obstacle course will make everyone excited at your party. The Deluxe Obstacle Course welcomes riders into its wonderland to explore more fun, maneuver around horizontal and vertical pop-ups, obstacles, push through a wall of inflated columns and crawl-through tunnels to race up the climbing wall and slide down to finish the game. The heavy duty material built to last provides a safe playground and entertainment for younger and older kids. Post-prom parties, corporate events, festivals, and birthday parties are just some of the events where you will find this inflatable. This open air design structure allows comfortable space and provides tons of fun to bring joy to every kid. Overhead netting is designed to prevent riders from jumping off the top of the slide and to ensure kids' safety. Who will be the first racer to reach the end?